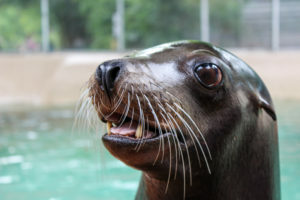 These sea lions are known for the high intelligence, playfulness and their loud, roaring bark. They have been seen porpoising, or jumping, out of the water and also surfing breaking waves. These sea lions are very fast swimmers, with the ability to reach speeds of up to 25 miles per hours for short distances. They are also able to travel quickly on land using their flippers. Because of their diet, they are preyed upon by Orcas, or killer whales, and also great white sharks. California sea lions have keen senses, including eyesight, however, they are not able to see in color.